Bobcats play loose and shoot fifty percent from the field on way to a 114-107 victory over the Phoenix Suns. Cats improve to 19-25 and start their first major road trip of the season 2-0. Thanks to some international broadband issues, I didn’t get to see much of this game so will intersperse some observations from writers around the Association. Gerald Henderson and D.J. Augustin in double figures? Wha? Clearly not the team leaders (yet) but have shown enough promise under Silas that the ’08 and ’09 Drafts look absolutely salvageable. That’s a big deal in Bobcats country. Henderson’s blocks on Gortat and Grant Hill were major game shifters. Rick Bonnell really likes what he’s seeing from Henderson too, going as far as saying he’ll help fill the void left by Tyrus Thomas. Also love the point he makes about Larry Brown vs. Silas. It’s like going from Larry David to Mike “Brady Bunch” Brady. All is good in the ‘hood. Really like what I’m seeing from Crash and Stephen Jackson thus far on the road trip. Those two shooting a combined 15-33 on the night is a massive improvement from the stinker the two captains dropped on Atlanta last week. Hope Silas finally talked some sense into them. UNDERRATED: Boris Diaw’s play under Silas. You won’t see it in the stats (although he’s added close one full assist more per game in January) but Boris looks much more motivated now than he ever did with LB. Big game against his old squad tonight going for 18/6/5 with a big boy rebound on the final possession to ice it. When fans from your old team still talk about your exploits two plus years on from a trade, you know you got the better end of the deal. Until Next Time, Enjoy the Win Bobcats Fans. WTF is going on in Phoenix? 1. First of all, they’ve clumsily broken up the most fun basketball team in recent memory (D’Antoni’s Seven Seconds or Less squad). They brought on the wrong coach, and fired him after half the season (eating $4 million in the process). They’ve made Steve Nash borderline depressed by trading away his buddy Raja. And now, depending on owner Robert Sarver’s mood (and portfolio) swings, they’ve been strongly considering trading their 24-year-old superstar, Amare Stoudemire. (UPDATE, probably not.) What a mess — Steve Kerr (and Sarver) are like bulls in a china shop. 2. 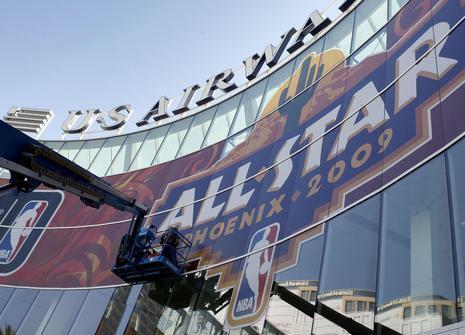 Then, they hosted a totally lame All-Star Weekend. Granted, the crummy economy had a lot to do with this, but still. 3. Now comes word that former Bobcat/now Sun Jason Richardson has racked up his second driving-related arrest since being traded. Just one week after the trade, J-Rich got pulled over for a DUI. But on All-Star night he got pulled in Scottsdale doing 90 mph in a 35 mph zone… with his 3 year old son unrestrained in the back seat! What the hell is going on? That J-Rich for Bell/Diaw trade is looking better by the day. In all seriousness, I hope everything’s OK with J-Rich. 4. And to top it all off, Suge Knight got beat up while in Phoenix for All-Star Weekend! It’s like Bizarro World — what are they putting in the water out there?